Our Industrial WT Innovation World Cup® 2017/18 winner, Intellinium, saves lives with their wearables that prevent accidents on worksites. 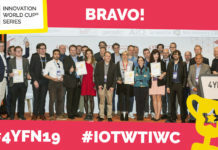 We interviewed Mathieu Destrian, the CEO/Co-Founder of the growing IIoT company about their journey as a start-up and experience in the IWC competition. 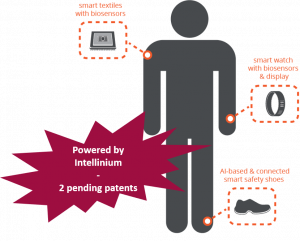 Intellinium was founded in 2009 to decrease the work-related accidents and injuries that cost companies €476 billion every year. We were convinced that something had to be done to cut these costs and keep people safe. Industrial IoT provided the answer! It allowed the team to embed Artificial Intelligence into existing personal protective equipment (PPE) and to connect them together as well as with machines and infrastructure. That’s where the name “Intellinium” also comes from (It means “to connect” in Latin), referring to the ability to connect humans with their devices/environment. The early prototypes grew fast into new forms because large industrial players reached out to us with their specific challenges to solve. In the beginning, we did not know yet either that the best solution would be a wearable, or that it should be worn in the foot. That we learned during the way. Based on the questions and individual requirements of the industrial customers, we developed our multiapplication hardware that represents today almost 90% of all safety features (making obsolete most, if not all, traditional existing equipment such as man-down or panic button devices as well as smartphone itself). 2. WHAT ARE THE KEY MILESTONES YOU’VE REACHED SO FAR? 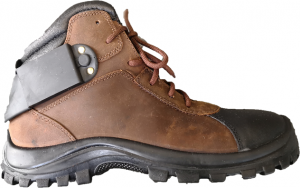 In 2014, Intellinium was the first start-up to come up with smart & connected safety shoes that can save and protect workers’ lives. Research & Development is done, and the first batch of 4.0 Safety Shoes are being produced! We have feedback flowing in and more patents pending, so that is a great success! Simultaneously, we are already working on the next production batch that is planned for next year after a fist pre-series in Feb 2018. Getting big names on board was also extremely important to scale up in our field, especially in the B2B sector. Large customers and suppliers help to boost early-stage production and benefiting from valuable references and word-of-mouth. 3. WHAT WERE THE BIGGEST CHALLENGES YOU FACED IN YOUR JOURNEY? 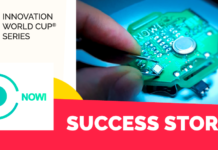 As a hardware start-up, the biggest challenge is to balance between entering the market with a competitive price and financing your product development. In addition to exceling both software and hardware, it is critical to find the right resources (human, financial, time etc.) and make smart choices. Based on my experience, the best way to solve this challenge is to look for large motivated suppliers that are willing to help you with some of the key resources, because they see the collaboration as a strategic win-win situation. They help you to succeed, and you help them to succeed! As mentioned, Intellinium is working on its second batch and constantly growing. The next steps are to build capital corporate venture and add new talents to the team. New contracts require more capacity to scale up and to support industrial partners! 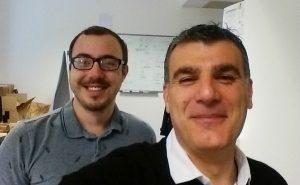 Intellinium expects a € 2-3 million round of capital for next year! Big money talking. Anyone with an interest, and if possible HSE experience, in the construction, mining, oil & gas, utilities and manufacturing fields; this can be a perfect chance to join the scaling up of a proven business idea and high technological engineering design. 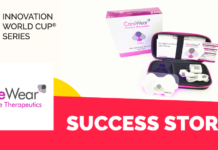 As recognized by the IWC Series judging team, this solution shows market potential! To get involved with a financial contribution or R&D skills (Design for Manufacturing & Assembly (DFMA) / DFx, Embedded Software Dev, Embedded Hardware Eng., Junior B2B Marketing & Communication assistant), contact job@intellinium.com. It’s a huge start-up network. We got in contact with several other start-ups that we still work with. A great platform for finding potential partners. Also, in the B2B sector, trust is a one of the main key success factors. In the B2C market, you can sell coolness, but in the B2B sector this does not work. 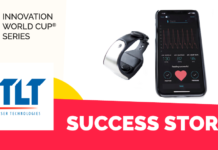 IOT/WT Innovation World Cup® helped us to create trust, credibility and visibility; so to build our brand! Passing their selection process and ending up as the Industrial winner (all for free), we now have a certificate in our office to highlight when potential partners, sales leads and customers pass by at the office. This is an excellent representation of trust in our innovation. 2 Be proud of what you do! Everyone wants to leave a legacy that truly matters (i.e. with positive impact on environment and society). Learn more about Intellinium at intellinium.io/. 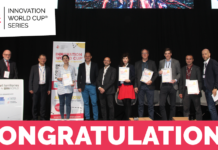 To be part of the Innovation World Cup ecosystem yourself and become the next Innovator of the Year, register your innovation to the 10th IOT/WT Innovation World Cup® here! For more success stories like these, follow our blog. Previous articleWANDERWATCH – A Startup is like a ride on a rollercoaster!